Do Jason Hayes and the Tier One team still stand at the ready? Has the SEAL Team TV show been cancelled or renewed for a third season on CBS? The television vulture is watching all the latest TV cancellation and renewal news, so this page is the place to track the status of SEAL Team, season three. Bookmark it, or subscribe for the latest updates. Remember, the television vulture is watching your shows. Are you? A CBS military drama, SEAL Team stars David Boreanaz, Max Thieriot, Neil Brown Jr., AJ Buckley, Toni Trucks, Jessica Paré, and Judd Lormand. The action-adventure series centers on an exclusive Navy SEAL unit as they train for, plan, and risk their very lives to carry out perilous missions for the sake and honor of the U.S.A. Fierce and focused Jason Hayes (Boreanaz) leads the Tier One team. Despite the hardship it causes them and their families, this SEAL team is ready, willing, and able to embark upon secret missions at the drop of a hat. Their love of country and deep resolve is unmatched. The second season of SEAL Team is averaging a 0.79 rating in the 18-49 demographic and 5.20 million viewers. Compared to season one, that’s down by 22% and 22%, respectively. Find out how SEAL Team stacks up against the other CBS TV shows. 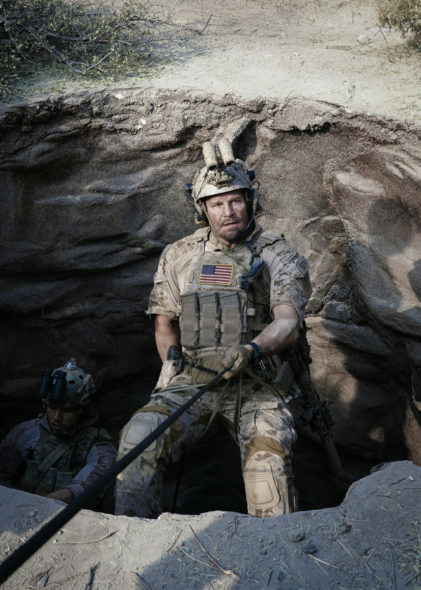 As of April 19, 2019, SEAL Team has not been cancelled or renewed for a third season on CBS. *Season two resumes March 13, 2019. Stay tuned for further updates. Will CBS cancel or renew SEAL Team for season three? The numbers aren’t great but the network needs newer dramas to eventually replace their older ones. This one could go either way. I will keep an eye on the Nielsens and update this page with breaking developments. Subscribe for free updates on any SEAL Team cancellation or renewal news. Find more SEAL Team TV series news or other CBS TV show news. What do you think? Do you hope the SEAL Team TV show will be renewed for a third season? How would you feel if CBS cancelled this TV show, instead? SEAL Team Is the CBS TV Show Cancelled or Renewed for Season Two? Finally quality tv has arrived 1000% better for viewers. SEAL TEAM is one of the best ever. Thank you CBS for giving us quality programming with the greatest cast of actors! Also, and most important, it’s a wonderful tribute and honor as a well-deserved salute to the men and women who protect us everyday and keep freedom alive for all of us. Thanks to the actors for sharing their stories with us. Please renew the Seal Team. I love this show. Please DO NOT CANCEL THIS WONDERFUL SHOW!!! Seal Team is the ONLY show I watch on CBS. I actually paid to watch the seasons on Fire TV. It’s a great show, cast and the fact a lot of the missions are based on real missions. It gives an insight as to how incredible the Navy Seals are and the things that go on while we live our day to day lives. They are fighting the bad people. Please don’t cancel seal team. Renew Seal Team for Season 3, the story lines, cast, writers etc are fantastic, Great show!! Please don’t cancel Seal Team, my husband and I watch this show together among other shows. Love love this show! All of the actors is awesome! Love Seal Team! Please renew for Season 3. I want to see what these veteran writers can do within another season. Their stories aren’t done yet. I certainly hope Seal Team is renewed for another season. I never miss an episode. The show does a good job of highlighting the emotions family members feel when their spouse/parent is military and is deployed. The bond between unit members is also well portrayed. I believe the ratings dropped because the series was moved to a new time slot and was preceded by the ridiculous show, Million Dollar Mile. Give Seal Team another season. Please please renew Seal team another season. This is outstanding programming…real..not glossy. I f we cannot watch we make sure TiVo it. Love the “Seal Team”. We watch it every week. Love the plots and action. Please do not cancel this show. I am a 71 year old grandmother and Seal Team is the absolute best show on TV.